The number two-seeded Army Black Knight's fell to the six-seeded Lehigh Mountain Hawks 76-57 in the Patriot League Semifinal game at the United States Military Academy's Christl Arena in West Point, NY on Monday, March 9, 2015. 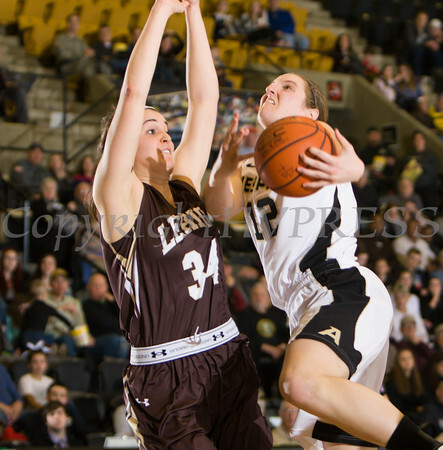 Army Forward Olivia Schretzman (12) drives to the basket as Kerry Kinek (34) defends. Schretzman scored 10 points as the number two-seeded Army Black Knight's fell to the six-seeded Lehigh Mountain Hawks 76-57 in the Patriot League Semifinal game at the United States Military Academy's Christl Arena in West Point, NY on Monday, March 9, 2015. Hudson Valley Press/CHUCK STEWART, JR.